Courtesy of Evoke Real Estate, Kaveh Shakeri. 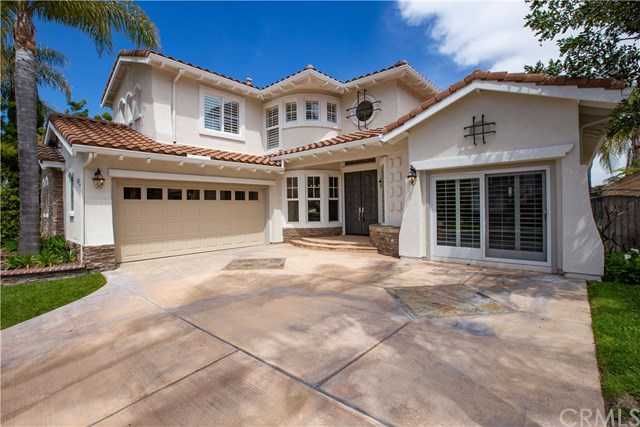 Gorgeous Laguna Niguel View Home in Guard Gated Hillcrest Estates. Enjoy a beautifully NEWLY REMODELED home with wide open views of the surrounding mountains, hillsides and city lights. Step inside to the foyer where you 8217;re greeting by soaring ceilings and abundant natural light. Wire-brushed wide plank wood flooring flows throughout the open and inviting floorplan. Relish in a designer chef 8217;s kitchen with Calacatta Laza quartz countertops, Valentino white marble, soft close cabinetry, and new stainless appliances. The kitchen opens to the family room with an attractive custom molding ceiling and cozy fireplace. The floorplan also features a main floor master suite with tons of closet space and a spa-like master bath with custom framed mirrors, soft close cabinetry, and Calacatta Laza quartz countertops. Step outside and enjoy the California sun with an in-ground spa, built-in BBQ and serving area, water fountain, and gorgeous views. Some notable highlights include new plush carpet, new water softener, in-wall vacuum system, and new interior and exterior paint. All situated close to beautiful beaches, restaurants, shopping, hiking/ biking trails, and excellent schools. Truly a rare find. Please, send me more information on this property: MLS# SB19028528 – $1,324,900 – 28662 Point Loma, Laguna Niguel, CA 92677. I would like to schedule a showing appointment for this property: MLS# SB19028528 – $1,324,900 – 28662 Point Loma, Laguna Niguel, CA 92677.